Advantages: Useful hints and tips; high production values; very helpful to actually see certain techniques in use; good spread of colour theory, history, preparation and actual painting techniques. Our hobby is a solitary one. We have hobby shops, model clubs, competitions and the Internet, but these tend to be social outlets . When we are actually performing the hobby of building and painting a model (be it figure, plane, tank or ship), we are generally alone with nobody to refer to. Books and Internet discussion groups can be helpful for picking up tips and techniques, but there is no substitute for actually seeing a modelling technique being performed. If a picture is worth a thousand words, a video is worth many more! 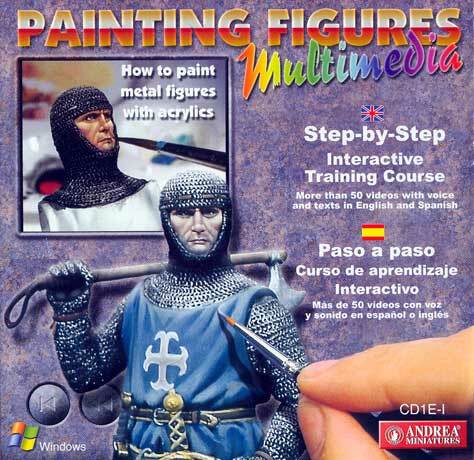 Andrea Miniatures has produced a CD with around 50 short videos on the subject of painting metal figures with acrylics. In reality, the techniques are equally valid for resin and plastic figures too (with the possible exception of priming). The CD starts with a panoramic view of a stunning 1/35 scale diorama of Andrea's Type VII U-Boat. A series of short clips run through the history of figure models, requirements for a workspace, tools, adhesives, and assembly techniques. A longer video on painting theory is next. I found this section particularly interesting. It describes overhead lighting technique, and some new insights (for me) into lightening and darkening colours. The real focus of the CD is painting the figure. A series of videos, each several minutes long, break down the painting of the face, garments, leather and wood into easily digested chunks. Each section includes a practical demonstration of the techniques on a 90mm Andrea figure. Plenty of time is spent showing the mixing of paints and the application of layers of colours, light and shade. The CD is capped off with a discussion about bases and display, plus some more examples of completed figures. It took me a little over an hour to view the contents of this CD. Production quality is first rate, with excellent lighting, close-up shots, clear voiceovers and a pleasant soundtrack of classical music. If you, like me, slop a wash over a figure then hope for the best, this CD might be for you! Actually seeing the techniques for highlighting and shadowing flesh and fabric gave me plenty of inspiration to make a bigger effort on my next figure. This will be a useful aid for anyone wanting to go to the next stage with figure model painting.